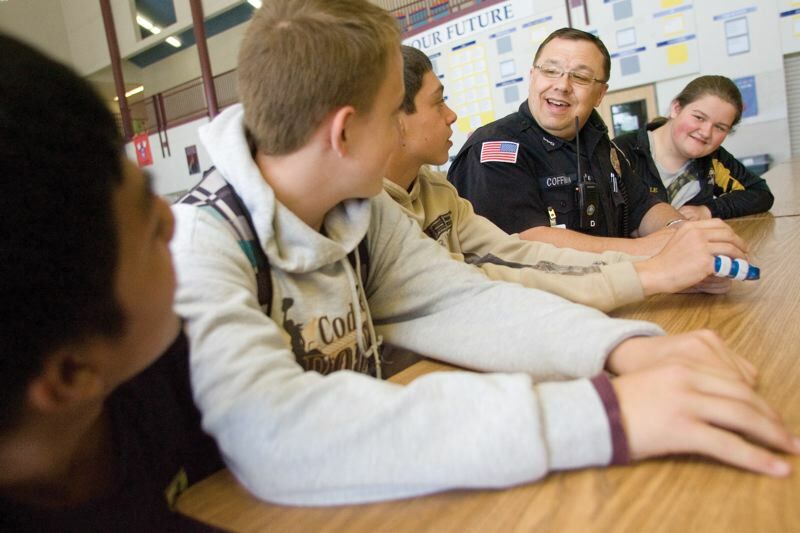 Rep. Diego Hernandez, Portland Public Schools board mull proposals over school resource officers. A new report lifts the veil on the arrests made in Portland Public Schools — but numbers alone are unlikely to quell the fractious debate over armed officers inside local classrooms. The seven-page document from Portland Police Bureau's strategic services division outlines a deluge of calls for service from schools that quickly narrows to just a trickle of arrests. Police caution that arrests involving juveniles often don't end with a suspect in handcuffs. In some cases, a parent or guardian is allowed to take their child home — or even return them to the educational environment — after a school resource officer files the paperwork necessary to begin adjudication through the juvenile justice system. Police Chief Danielle Outlaw adds that the bureau "values safety within and around our schools" as a top priority. "We understand these incidents can have lasting impacts on those involved," she said, "which is why it is imperative for SROs to build relationships with students, parents and faculty so they have that foundation when they respond to calls at schools." • School Resource Officers arrested 17 youth on school grounds during school hours. SROs made another three arrests off campus. Officers not classified as SROs made an additional eight arrests of youth during class time, for a total of 28 arrested. • The three off-campus arrests involved an adult arrested on a MAX train after allegedly vandalizing a car parked near a school; a youth arrested at home, who was processed and fingerprinted, then dropped off at school; and a third arrest in another school jurisdiction. • Another 13 people over age 21 were arrested during school hours. • Portland Police received 5,438 calls for service at school addresses. Excluding evening and weekend calls when SROs are not available, there were 3,866 calls. • Of the 17 arrests by SROs, four were discretionary — meaning that an officer determined a crime had occurred. In the other 13 cases, police say "complainants were adamant" that an arrest be made. Authorities say the specifics are confidential. • In three cases, the arrested person had a warrant. Other incidents involved possession of a firearm, unlawful entry into a motor vehicle, distribution of marijuana, reckless burning, first-degree theft, forgery, harassment and menacing, among other charges. • In cases where a youth was arrested without a formal warrant, eight ended in probation, three ended in an accountability agreement and three ended with the district attorney dropping charges. "None of these cases resulted in a final outcome of incarceration," police say. Context — and contracts — surround the bureau's report on arrests in schools. In late January, Portland Public Schools backed out of its pending deal with the police bureau to begin paying $1.2 million a year to defray costs for nine school resource officers. While the Board of Education expects to consider signing a revised contract as soon as this month, a majority appears to agree that it should be PPB's responsibility to pay for officers assigned to schools. Board members also complained that police leaders pressured them into signing the initial contract by using a "false deadline." The reversal scored a point for student activists, who have demanded that police stop patrolling Portland classrooms entirely. As the debate rages, police have been keeping busy. On March 7, officers rushed to the health center at Franklin High School, where they found an 18-year-old male with "non-life-threatening" stab wounds. At this time, no arrests have been made. Just a day earlier, on March 6, Hosford Middle School entered lockdown after reports that an intoxicated naked man armed with a hatchet was running and yelling outside the school. One officer was stabbed in the hand during the subsequent arrest of Jonathan D. Messare, 34. A Portland Democratic lawmaker has entered the fray with his own idea, which would essentially disarm the police patrolling Portland State University and the University of Oregon. Rep. Diego Hernandez's proposal, House Bill 3338, technically prevents university police from taking their guns "outside of the police headquarters" in cities with a population over 150,000 — such as Portland and Eugene, but not including Oregon State University in Corvallis. "The fact of the matter is students at both campuses have said time and time again they do not want armed police on their campus," Rep. Hernandez explained. "It's time we listen to students." Unsurprisingly, PSU administrators have taken a dim view of the bill, which has been scheduled from a public hearing March 21 in the House Judiciary Committee. A spokesman for PSU argues campus police are a "vital component of student safety at a large urban university." The spokesman said: "We believe the campus process must proceed without a mandate from the legislature and that it's important that the legislatively established public university boards of trustees be authorized to establish the policies they believe are best to ensure the safety of everyone on PSU's campus."